Barrie Summy: And the summer fun begins! No one asked the poor chameleon about location hopping, and summer has barely begun. Heh, I don't know if I would be okay with someone putting a lizard on my head. Little claws seem like a bad idea on my poor head. Sounds like you're going to have some fun. I'm with Barbara. Does the chameleon get any say in where he (she) perches? Have a great summer, Barrie. Enjoy them while they're with you!! They all grow up too fast. You are so in for a wild summer. cool! how are the eggs coming? Kaye: Sadly, five have shriveled; one even more than the others. However, I did read that sometimes you think an egg won't produce and, surprise! So, I'm hoping not all the five are goners. And...the other 18 are going strong. Also, both chameleons shed this past week. So, yay! I bet that was WAY more reptile info than you were expecting! 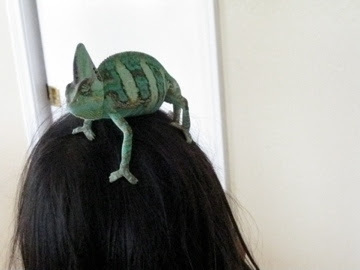 A chameleon hair ribbon. Cool. I had no idea that creature was so big! Younger siblings are so trusting and vulnerable, aren't they? 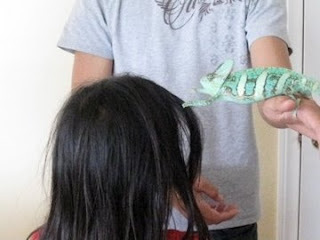 I remember putting lizards on my head in Jr. High, but never one as big as a chameleon! So, Solvang Sherrie, it's a Southern California thing? Ha! Ahh ... the memories they will have. I'm pretty sure that chameleons are more fun than chickens! So pretty against dark hair as well . . . I love your chamleon stories! The youngers are so trusting...and the olders know it! Hey, at least #2 asked permission. How cute! That thing is so pretty. How are the eggs doing? While this particular incident hasn't happened here, I can certainly identify with it!